Foreign Ministry spokesman Qin Gang yesterday again urged the international community to see the Dalai Lama's "true face" and offer no support for his secessionist activities. Qin made the remarks in response to US Secretary of State Condoleezza Rice's recent call for China to consider a new policy to address the Tibet issue and to start talks with the Dalai Lama. US House of Representatives Speaker Nancy Pelosi also visited the Dalai Lama last week. 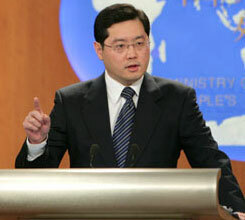 Qin said the position of just a few countries did not represent that of the international community. More than 100 nations have expressed their support and understanding of the Chinese government's attitude to protecting the lives and property of its citizens from violent riots, he said. Qin said the central government's policy toward the Dalai Lama is consistent and explicit, saying it not only listens to what he says but, more importantly, observes what he does. China yesterday also criticized a British newspaper's report that linked the Beijing Olympics with the Berlin Games of 1936, saying the story is an insult to Chinese citizens and to the people of the world. A report published in the British newspaper the Sunday Times said China is holding the Olympics for the same reason Adolf Hitler did in 1936, as an opportunity to collect accolades. Qin said the Beijing Olympics is a magnificent sports meeting, and people from all nations have expressed their wishes to use it as an opportunity to enhance global understanding, friendship and cooperation. "The Olympic torch symbolizes humankind's noble ideals and beautiful aspirations," Qin said.
" It also casts light on the gloomy mentality of some people, which will help the common people see their true face," he said. "The Beijing Olympic Games must be a success with all the efforts made by the people of the world."